It's true that Yoga is for everyone. Did you know that Yoga could be practiced by kids? In this article, Kid’s Yoga is explored with attention to the current various types of kid’s Yoga commonly in practice. Why would kids practice Yoga? Kids are under more stresses than ever in today's modern world. Stress can stem from school, sports, friends and parents. More and more, kids are turning to Yoga as a way to cope and relax. For many years, kid’s Yoga has been practiced in many schools, especially in physical education classes, Yoga ashrams, etc. The Yoga training may include Yoga poses along with meditation and relaxation training. Yoga helps kids develop better body and mind awareness, self-control, flexibility, self-control, mind and body health and inner harmony and peace. Yoga for kids is also lots of fun. Yoga complements all kinds of others activities such as sports, dance, singing, learning, memorizing as well. Yoga exposure to kids can begin as early as infancy but usually a minimum age of 3 is required to perform simple Yoga poses adequately. As kids get older and their coordination and concentration improve, they can attempt some more difficult yoga poses. Kids Yoga classes will be more casual and light as kids will usually have more questions and have a tendency to goof around more than adults. For kids below 6, each Yoga pose should not exceed 1 minute and the entire Yoga session should not exceed 15 minutes. For kids above 6, each yoga pose should not exceed a minute and a half and the entire Yoga session should not exceed 25 minutes. The first and foremost thing to remember in Kid’s Yoga is ‘encouragement’. They must be influenced and inspired through the way of one’s Yoga teaching. Each and every step must be taught with absolute accuracy. Visual demonstration is usually the best way to communicate how to carry out each Yoga pose. Use positive reinforcement to help guide the Yoga poses. Kids will most likely not be able to perform all the poses “correctly” so it is probably best to keep things simple. Before beginning their Yoga practice they must be allowed a thorough warm up If poses are performed incorrectly, do not use physical pressure on them. However, do not allow them to perform Yoga poses wrong consistently or it may affect bone formation. Some of the basic kid’s Yoga poses may include archer’s Yoga pose, mountain, tree, Sri Rama and jumping jacks Yoga poses. Kid’s Yoga should always be taught by a certified Yoga teacher. Archers Pose:provides a good concentration power and stamina for kids. Mountain Pose:stretches the entire body and also increases the energy level. It involves standing with hands raised up with palms together. Lotus Pose: This pose is great for anytime kids want to get away from the world and tune it out. 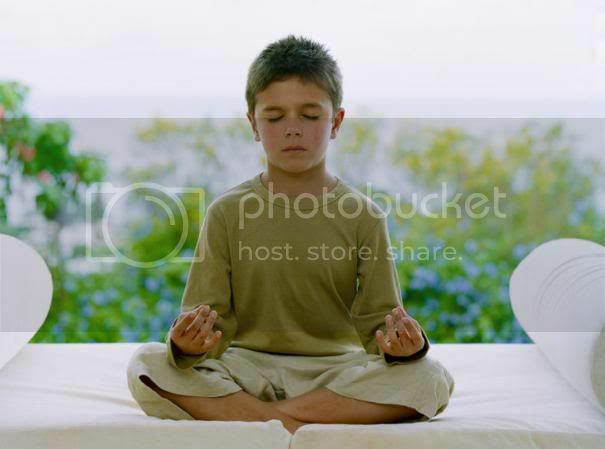 Child’s Pose: This is a terrific pose to relax the eyes, shoulders, and back, and also rejuvenate the mind.